But that’s what back-to-back must-wins at Chase Field will do for you. Now the team prepares for an improbable-turned-decisive Game 5 back at Miller Park Friday afternoon. Just like Game 1, starters Ian Kennedy and Yovani Gallardo will tangle once again. Last Sunday, the D-backs’ ace got tagged for the loss after surrendering 8 runs on 4 hits, 2 walks and 2 hit batters to go along with his 3 strikeouts in 6.2 innings. Meanwhile, his Brewers counterpart went 8 innings, giving up 1 run on 4 hits and fanning 9 in the win. And nobody wants another chance at Game 1 redemption more than the National League’s first 20-game winner this season. 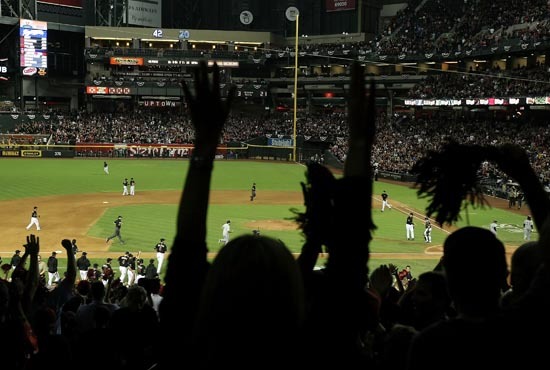 Seeing their runs-per-game average jump to 9 over the last two games, the D-backs are riding a two-game winning streak, but they know they’ll have to make it three (with this one being on the road) to advance to the NLCS. First pitch is at 2:07 p.m. on Friday, Phoenix time. The game airs on TBS.